转变空军思维定势，发展联合兵种能力，开展近距空中支援 - 《空天力量》杂志 - 知远防务论坛 ----学术性|资料性|研讨性！ - Powered by Discuz! Stephen E. Ambrose, Citizen Soldiers: The U.S. Army from the Normandy Beaches to the Bulge to the Surrender of Germany, June 7, 1944–May 7 [公民士兵：美国陆军从诺曼底海滩到突出部之战到德国投降，1944 年 6 月 7 日至 1945 年 5 月 7 日], 1945 (New York: Simon & Schuster, 1997), 67–68. Maj Edgar Fleri et al., “Operation Anaconda Case Study” [蟒蛇行动战例研究], (Maxwell AFB, AL: College of Aerospace Doctrine, Research and Education, 13 November 2003), 23, http://64.233.167.104/search?q=cache:Ovga80WD8UgJ:[url]www.maxwell.af.mil/au/awc/ns/electives/AirpowerPostGulfWar/Lsn08/ANACONDA%2520Case%2520Study%2520UNClass%2520Final.pdf+%E2%80%9COperation+Anaconda+Case+Study%E2%80%9D&amp[/url];hl=en&ct=clnk&cd=9&gl=us (accessed 30 June 2008). Headquarters United States Air Force, USAF/XOL, Operation Anaconda: An Air Power Perspective[蟒蛇行动：空军视角], (Washington, DC: Headquarters United States Air Force, USAF/XOL, 7 February 2005), 62–63, http://www.af.mil/library/posture/Anaconda_Unclassified.pdf (accessed 26 December 2007). Fleri et al., “Operation Anaconda Case Study” [蟒蛇行动战例研究], 21. Wikipedia: The Free Encyclopedia, s.v., “Operation Anaconda” [蟒蛇行动], http://en.wikipedia.org/wiki/Operation_Anaconda (accessed 26 December 2007). Headquarters United States Air Force, USAF/XOL, Operation Anaconda [蟒蛇行动], 6. 同上, 7; 及 Fleri et al., “Operation Anaconda Case Study” [蟒蛇行动战例研究], 18. Fleri et al., “Operation Anaconda Case Study” [蟒蛇行动战例研究], 28–30. Erik Holmes and Gina Cavallaro, “800 Insurgents: Airmen Play Pivotal Role in Victory at Najaf” [铲除 800 反叛分子：空军飞行员在纳杰夫胜利中发挥关键作用], Air Force Times, 3 December 2007, 14. “AC-130H Spectre, AC-130U Spooky” [AC-130H 幽灵攻击机和 AC-130U 鬼怪攻击机], FAS [Federation of American Scientists] Military Analysis Network, http://www.fas.org/man/dod-101/sys/ac/ac-130.htm (accessed 20 January 2008). William L. Smallwood, Warthog: Flying the A-10 in the Gulf War [在海湾战争中驾驶 A-10 疣猪攻击机], (Washington: Brassey’s, 1993), 142–43, 178–79, 190–91, 200, 205–7. Maj David D. Dyche, “Military Reorganization: Challenge and Opportunity” [军事重组：挑战和机遇], GlobalSecurity.org, http://www.globalsecurity.org/mi ... report/1990/DDD.htm (accessed 23 April 2008). Christopher Bolkcom, F-22A Raptor, CRS Report for Congress RL31673 [F-22A 猛禽，CRS 提交国会的报告 RL31673], (Washington, DC: Library of Congress, Congressional Research Service, 12 June 2007), 4, http://www.fas.org/sgp/crs/weapons/RL31673.pdf. “A Higher-Tech Hog: The A-10C PE Program” [高科技“猪”：A-10C 精确交战计划], Defense Industry Daily, 22 January 2008, http://www.defenseindustrydaily. ... 0c-pe-program-03187 (accessed 27 June 2008). Hopper, “A-10 Thunderbolt II” [A-10 霹雳 II]; and “A Higher-Tech Hog” [高科技“猪”]. 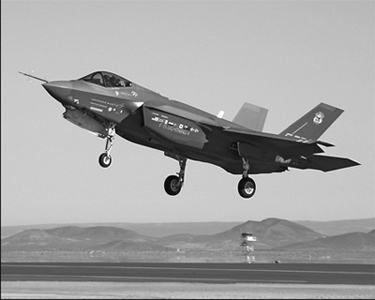 “[The Joint Strike Fighter] Program,” F-35 Joint Strike Fighter Program [F-35 联合攻击机项目], http://www.jsf.mil/program (accessed 27 June 2008). Fleri et al., “Operation Anaconda Case Study” [蟒蛇行动战例研究], 28. United States General Accounting Office, Military Readiness: Lingering Training and Equipment Issues Hamper Air Support of Ground Forces [战备完好率：延宕已久的训练和设备问题阻碍空中对地面部队的支援], GAO-03-505, Report to the Ranking Minority Members, Subcommittees on Total Force and Readiness, Committee on Armed Services, House of Representatives (Washington, DC: General Accounting Office, May 2003), 3, http://www.gao.gov/new.items/d03505.pdf. 攻击机大受赞赏], Air Force Link, 27 August 2007, http://www.af.mil/news/story.asp?id=123065959 (accessed 30 December 2007). 攻击机], FAS Military Analysis Network, http://www.fas.org/man/dod-101/sys/ac/a-10.htm (accessed 20 January 2008).